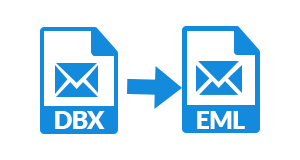 The DBX to EML Converter software has been developed for the conversion of Outlook Express DBX files into EML format. It has the potential to migrate all the DBX files in batch mode very easily. This means users can choose as many files as per their requirement. These selected files can be migrated at once. The software is very easy to use and every user can access it easily. 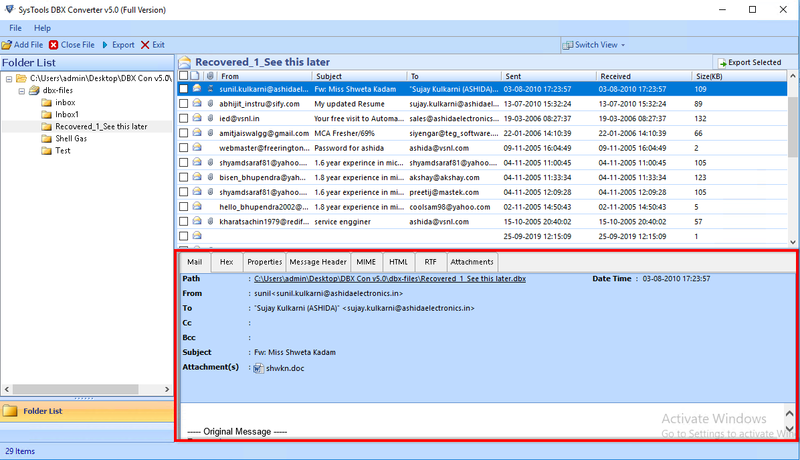 Before the process of conversion, users can view each mail message body of chosen DBX file in various ways. 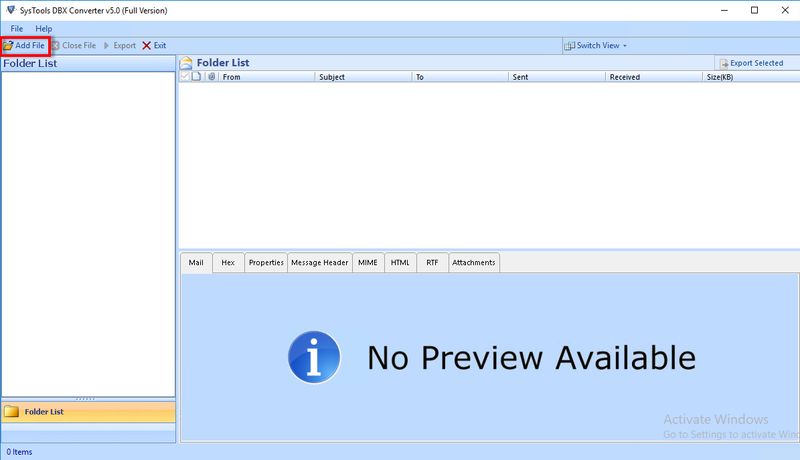 For example Normal view, Email Hop View, Hex View, Message Header View, Property View, Attachments view, etc. Apart from this, in the panel of software there is an option to switch view. Using this, the view can be changed into vertical or horizontal mode. This is one of the essential features of DBX to EML Exporter. According to this, users can even open the attachments. 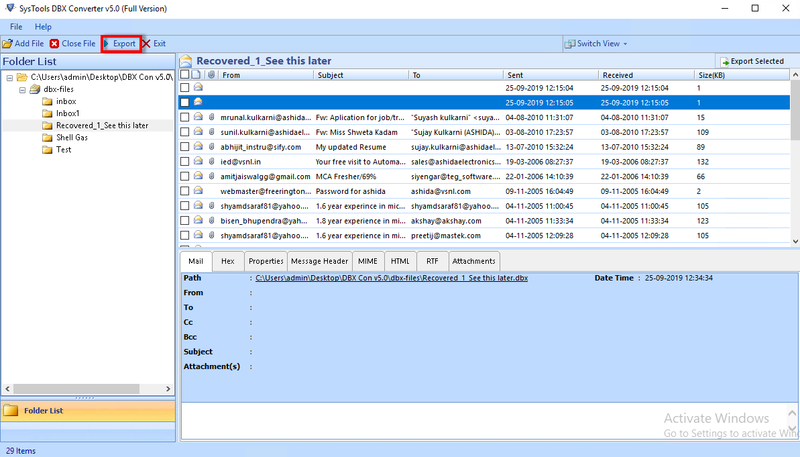 Once the tool loads all the files, it provides a preview of all the emails along with the associated attachments. These attachments can include anything like images, videos, documents, etc. Once the data is converted into EML, it can later be accessed into supported email applications. Quick Mode: Using this mode, users can repair minor corrupted Outlook Express files. It is the by default mode for scanning. Advance Mode: On the other hand, advance mode is helpful to repair highly corrupted files. Another added feature of this utility is that it provides different naming convention options to save DBX in EML format. Users can choose the required naming option from clicking on the drop-down menu. 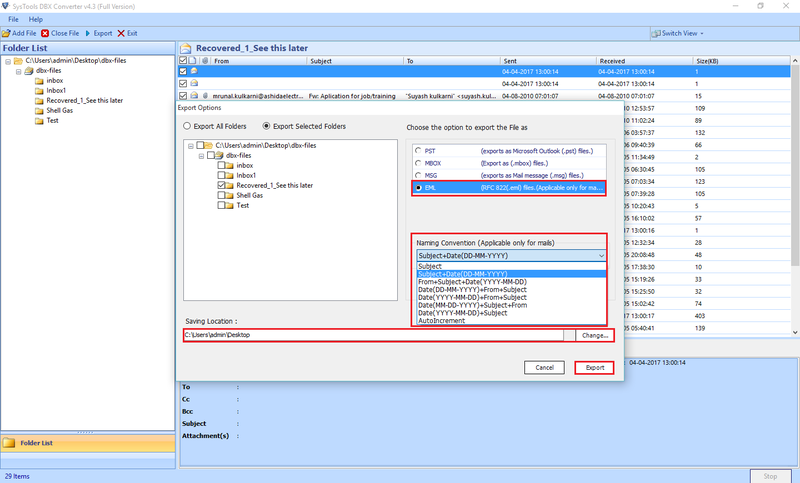 Moreover, they can save the EML files with date, subject or various other combinations during importing DBX to EML File Format. The Outlook Express to EML Converter is also capable to migrate only the selective data into EML. This means, it is not necessary to choose every file or folder if not required. With this advance utility, users can even select only the desired files/folders and export them into EML. In addition, the software performs the folder hierarchy throughout the whole process and selective conversion saves the time. Can I perform DBX Emails to EML Conversion even if the DBX files are corrupted or unhealthy? Yes, the software first scans and repairs the files and after the scanning the files can be converted into EML format. Does the software can convert the files in batch mode at a time? Yes, DBX File to EML Converter is efficient to perform the migration in bulk and makes the process fast. Can I repair Outlook Express DBX files that are corrupted in a severe manner? Yes, it comes up with two different options to repair the file. For severely corrupted files, advance scan option can be used. Does the software DBX Emails to EML Converter, can migrate a file of 20GB? Yes, the software can move any file of DBX File to EML format without any size limitations. I do not know the location of DBX files in my system. Is it possible to auto-detect the DBX files? Yes, this one of the interesting features of the tool that it can even detect the DBX files automatically from the storage location. 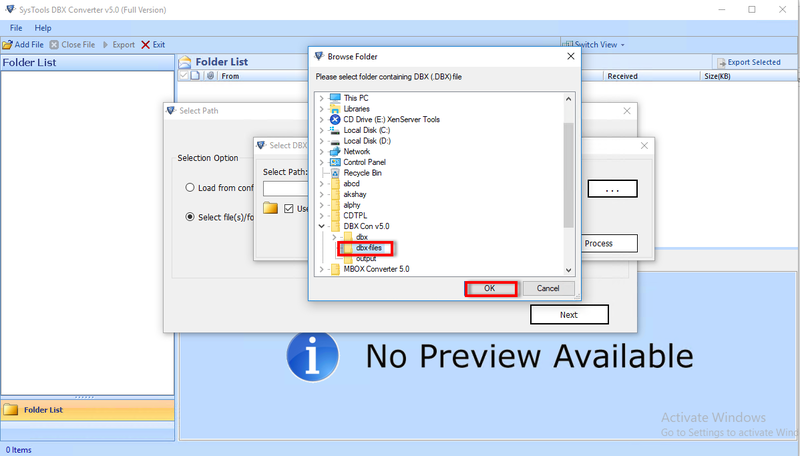 Firstly, click on Add & Browse the DBX files/Folder via this tool. You can also detect the path of DBX files, if you are not ware with that. Next, mark in front of the two boxes if you want and then click on Process. After this, pick any of the desirable options of naming conventions. 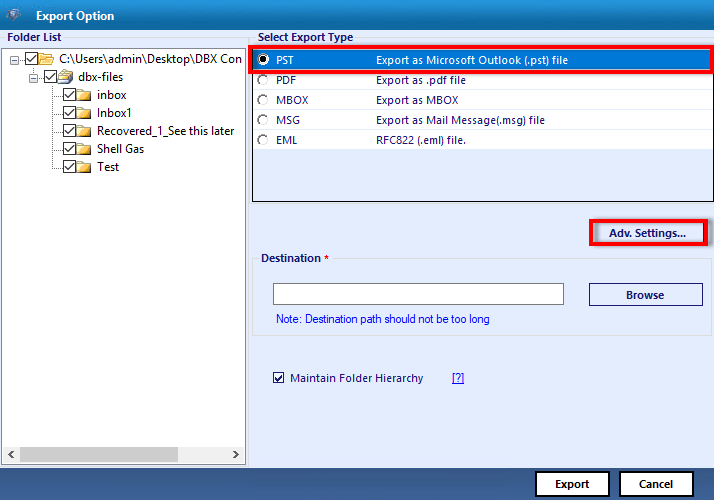 Now, choose the location to save the resultant files and Finally, click on Export. "Outlook Express to EML Converter is a simply amazing utility. In fact, this is one of the best utilities, I have ever used. It helped in a very crucial situation. It is so amazing that it has been developed with such advance algorithms, yet has a simple-interface. It can even accessed by a novice. I would like to recommend it to those users who are facing the problem in the migration of DBX to EML file format." "I was searching for a tool to import DBX file emails to EML files because I was sick of manual methods. Then, one of my colleagues has suggested me DBX to EML Converter tool. I was a bit unsure in the starting about the security of the data. However, later I used this software and was amazed with the working, designing, and thinking behind such a technology. Kudots! to the team of developers."